While we don't like to hear bad news and don't appreciate the pronouncement of judgment on others, there is a time when it is appropriate. Jesus was not only our sacrificial lamb, but he is also our Chief Shepherd. 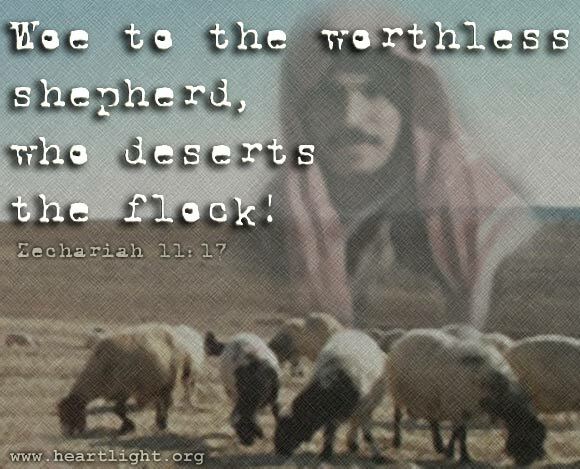 When the earthly shepherds of his sheep do not lead faithfully, he will demand harsh justice. This is a warning to all who lead that they must do so faithfully and tenderly. It is also a comfort to those who have been abused by ungodly leaders -- God will wipe away your tears and he will bring about a righteous justice to those who have abused the stewardship of their pastoral calling. O LORD, my Shepherd, thank you for leading, guiding, and nourishing me. Please raise up in your Church leaders of conscience, courage, and compassion to shepherd your sheep and to lead them with the heart of Jesus. If I can be used in this capacity, please use me, dear Father, to bless your people and to serve with your heart for people. In the name of Jesus, my Good Shepherd. Amen.